Construction workers performing construction outside the Moffett Library Nov. 28. For students going into Moffett Library to study for their upcoming final exams, getting a preferable spot is already tough. 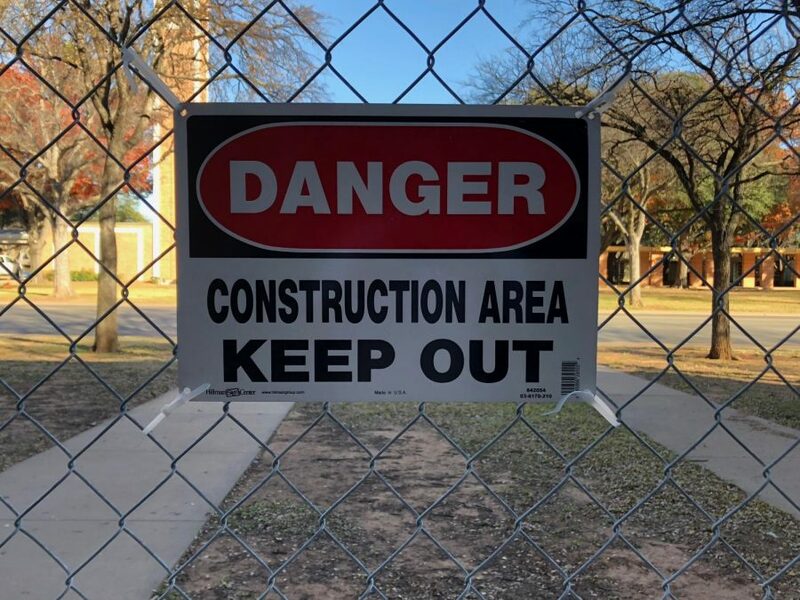 Yet, the dilemma has another twist as the construction of the Moffett sees the second and third-floor being shut off to students. Students have access to only one floor during finals week to study during the remodels. Sara Burrows, respiratory care senior, said the congestion of the library affected her studying performance for the worse. “It is hard, I can’t find quiet areas to study and it is hard to find tables to sit at. There are not many outlets to charge your devices anymore,” Burrows said. Claudia Antill, pre-pharmacy junior, said there is an increased vocality among students at the library because of how people come in groups. “It would be nice to have an extra floor because there’s a lot of people that come in groups. Just having the extra space would be nice just so not everyone would be so close together and we’re not having to listen as to what other people are talking about. Some people are more verbal and louder than others,” Antill said. Matthew Mitchell, chemistry junior, said the waiting time to find a table to sit was lengthy. “I was trying to find a table for my group to sit at for twenty minutes and all the tables were filled because we’re all on the first floor,” Mitchell said. Teresa Vu, chemistry junior, said she was disappointed with the second floor of the Moffett Library being shut off. “I study mostly on the first floor, but sometimes on the second. I am disappointed because there are less tables available on the first floor since the other two floors are closed,” Vu said. Elizabeth Chavarria, business management senior, said she was disappointed with the lack of study rooms. “I am not a fan of sitting on the first floor because a lot of people do talk. In the second floor, you were able to talk, but some certain areas you have study rooms,” Chavarria said. 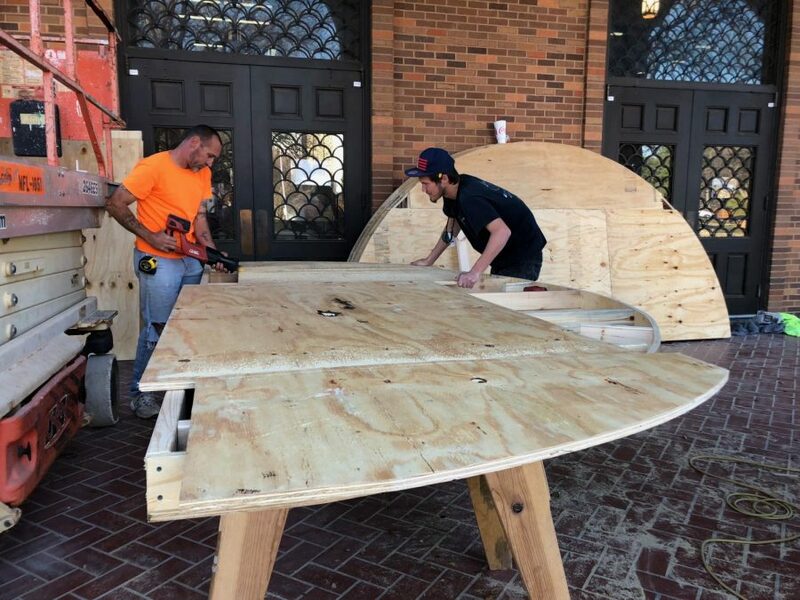 Kyle Owen, associate vice president for facility services, said there were two phases that the Moffett Library undertook during the course of the semester. “We have known for a while that we needed to close parts of the library this fall. Initially, when we first developed this project, the intention was that the restrooms would be done by the time that classes resume in August. We called that phase one. Phase two is what is going on now. Those drawings were completed in early summer, we bid out the project, got the bids back in August and we were hoping by early September, we could release the contracts to start the construction. Mid to late September, we release the contract so we could start construction that is starting now. As the case, we have to do negotiations relating to the bids, get everything signed off because there is a process we have to go through,” Owen said. Owen said the official okay for construction did not come to an agreement until Nov. 1 due to negotiations. “It had to do with prices that came in, some of them were higher than we wanted. We talked about value-engineering, basically a way to cut budgets. We reviewed options to get within budget which is quite difficult within any construction project and that process can take some time,” Owen said. Owen said the decision to shut off the second and third-floor section of the Moffett Library was not made by one person. “It was a committee of people. The conversations which consist of the contractors, the head librarian, Dr. Latham, and the administration, the decision was made based on that it would be the most expeditious way and it would maximize our dollars. Best value is what drives the decision. We want to optimize the money, we don’t want to waste any more of it. The more money we spent for a guy to shuffle books all around is less carpet we get to put in the building,” Owen said. Among students, frequent comments were that the construction of the Moffett Library could have been halted. Sydney Bateman, education senior, said construction should have waited for a future date. “It could’ve been planned better. I know they did start construction during the summer and I know construction takes time. But at the same time, they knew finals week was coming up and they should have not shut down the entire library during the week of finals. They should have waited until the break and next semester rather than trying to finish over finals, just because no one has a place to study. That’s not fair,” Bateman said. Owen said if the project was delayed for another month, it would create a scheduling conflict. “We have about eighteen months of work to do. If we delayed it another month or two, the whole calendar just shifts. At this point, we’re planning to be through of April 2020. Instead of being done in April 2020, it would be done in June 2020 which means the people that taking finals in May 2020 wouldn’t be able to use it [Moffett Library]. Pick your poison. I realize that students now, particularly seniors, will not worry about what about what someone is going to deal with a year and a half from now. People from a year and a half now will be glad we started when we did. You’re going to tick someone off no matter how you look at it,” Owen said. Students said despite the inconvenience of the situation, they understand the situation. Christopher Sun, biology sophomore, said there should not be maximum criticism. “I find construction as inconvenient as opposed to unacceptable. At least they’re trying to make it better. They’re trying to do something for us in the first place, I don’t think we should feel the need to feel harsh towards the construction,” Sun said.